If you’re bored with the same old uniforms that your favorite NFL team wears every week, then we’ve got something special for you. 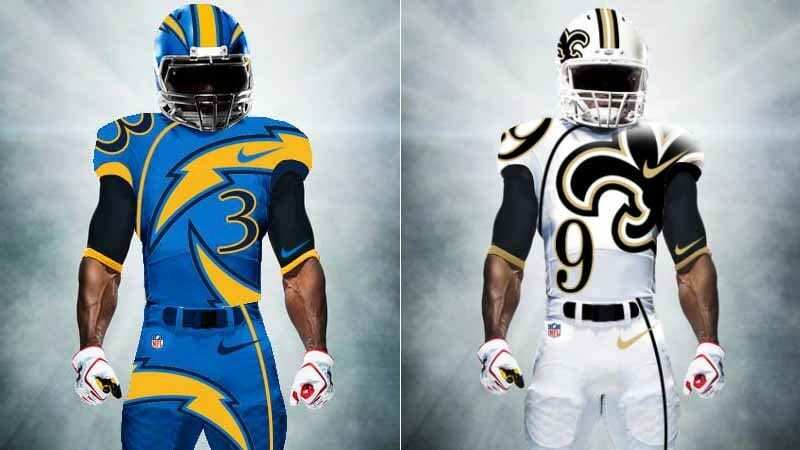 These awesome concept designs for all 32 NFL teams take the boring old jersey designs and brings them into the 21st century. 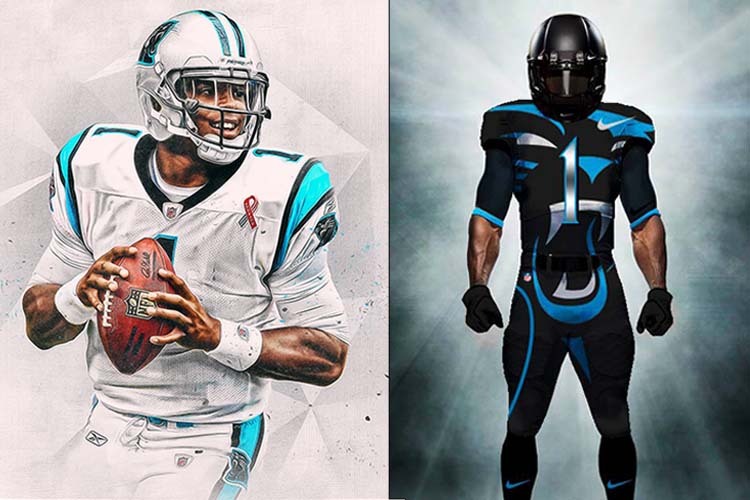 But keep in mind, these are just concepts, so there’s no guarantee you’ll see these uniforms on Sundays or Mondays. 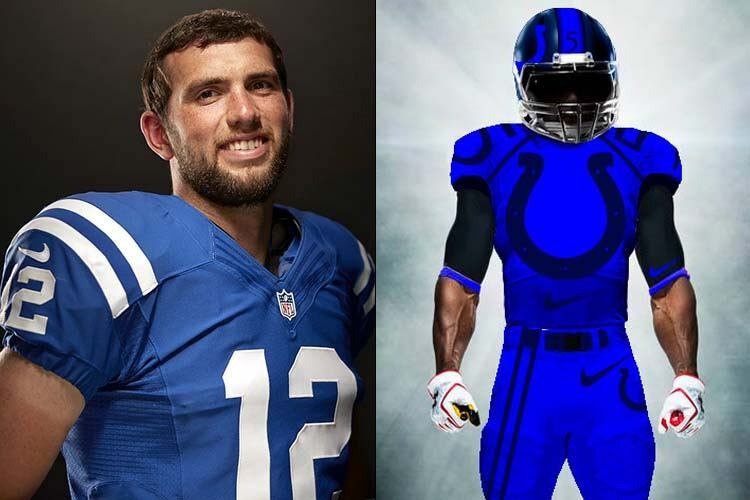 For comparisons sake, we created side by side images of the current uniforms vs the concept uniforms. To see all 32 teams, make sure to check out the entire slideshow. 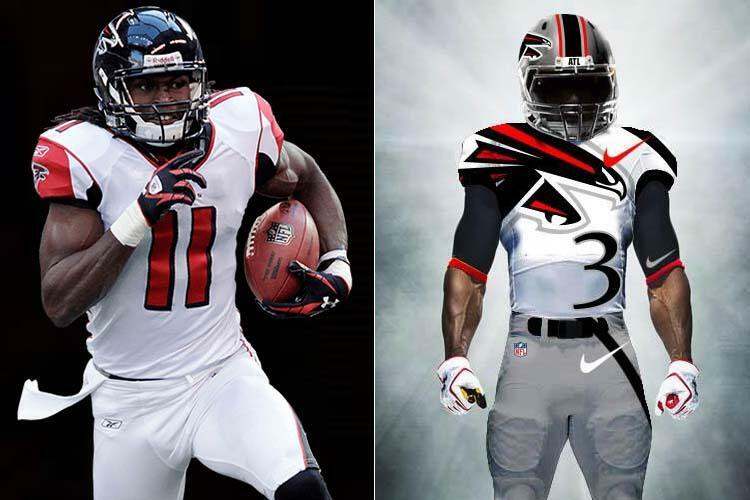 Without further delay, here are the awesome new concept designs for all 32 NFL teams. 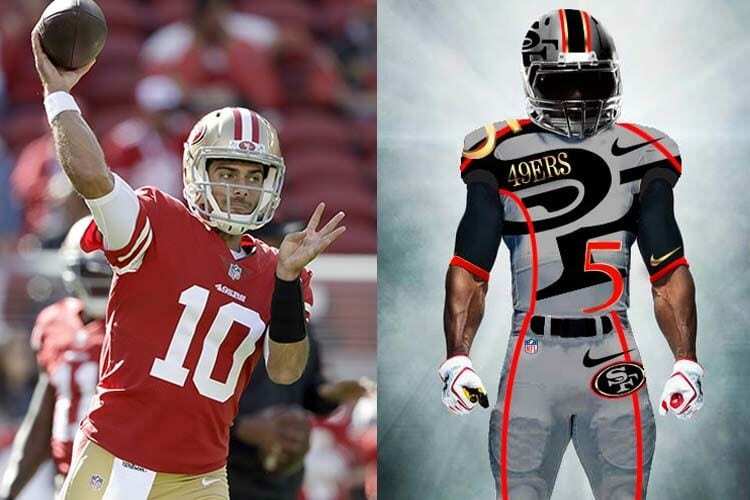 49ers – San Francisco got its new starting quarterback midway through the 2017-2018 season, so why not get him some new fancy duds to wear this year? The silhouette of the “SF” initials for the city look pretty slick on this do, but the number on the bottom right of the torso (if you’re facing it) might be easy to overlook for fans sitting far way from the action. 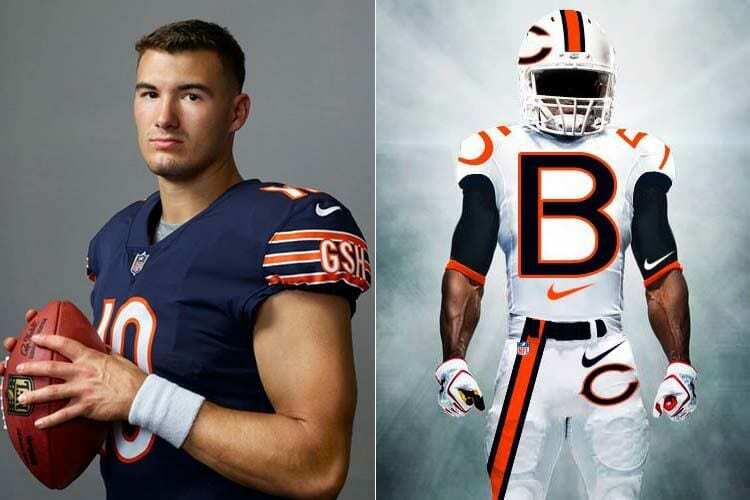 Bears – While this concept uniform looks cool in theory, it might not be that practical if applied in reality. For instance, if you’re a fan sitting far away in the stadium, how would you even know if the Bears have Mitch Trubisky in at quarterback, considering the jersey number is only seen on the sides of the shoulders, and thus might not be visible at several angles? 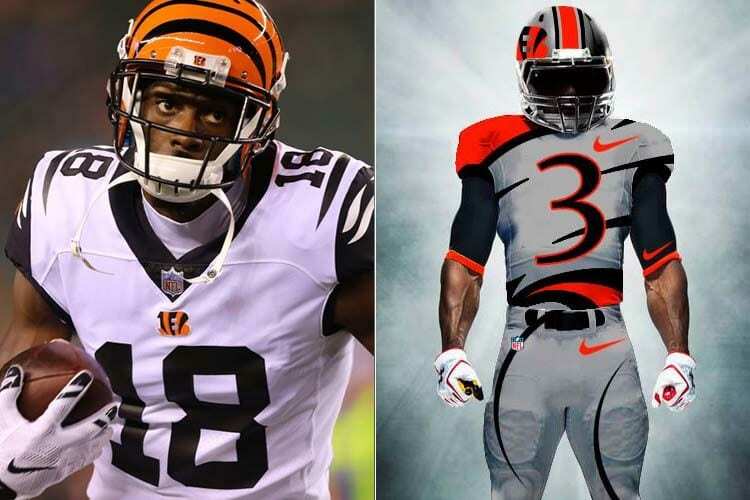 Bengals – Is it just us, or does this uniform look like the love child of the Cincinnati Bengals’ uniform, and the Ohio State Buckeyes’ uniform? Adding the gray background to the helmet helps accentuate the orange “B,” but said gray color isn’t really in the Bengals’ color palette, and might not make sense. 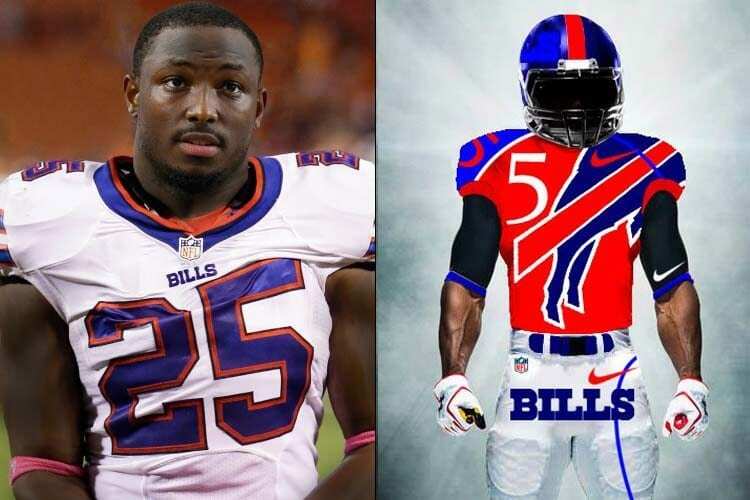 Bills – This uniform takes an avant garde interpretation of the current uniforms worn by LeSean McCoy and the Buffalo Bills, with the leaping Bill emblazoned across the front of the uniform. The numbers in the top left of the uniform and on top of the shoulder pads work well also, but we might dock a few (hypothetical) points for removing anything from the helmet. 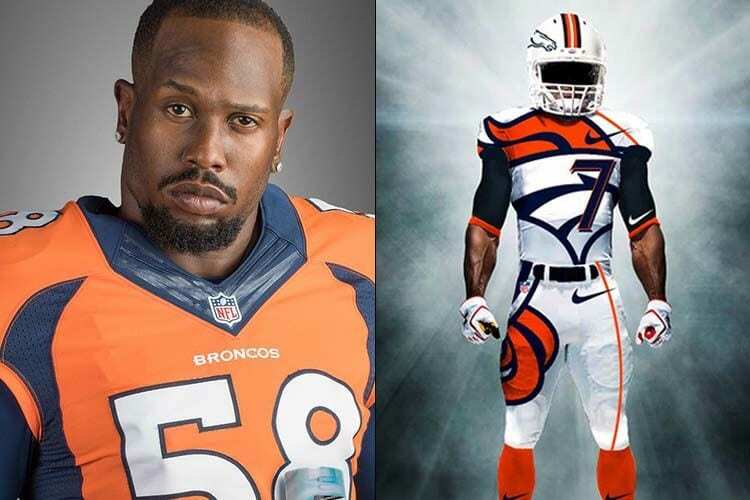 Broncos — This version of the jersey takes the modern-look “Orange Crush” jersey worn by Von Miller and the Denver Broncos to the next level, though we’d have to get a better look at where the team’s iconic orange will be added on, instead of just relying on that color to originate from the horse’s hair. Browns — Even if this jersey continues with the same issue of the number being too small for this, it’s a really good and upgraded look for their jerseys worn by guys like Myles Garrett. 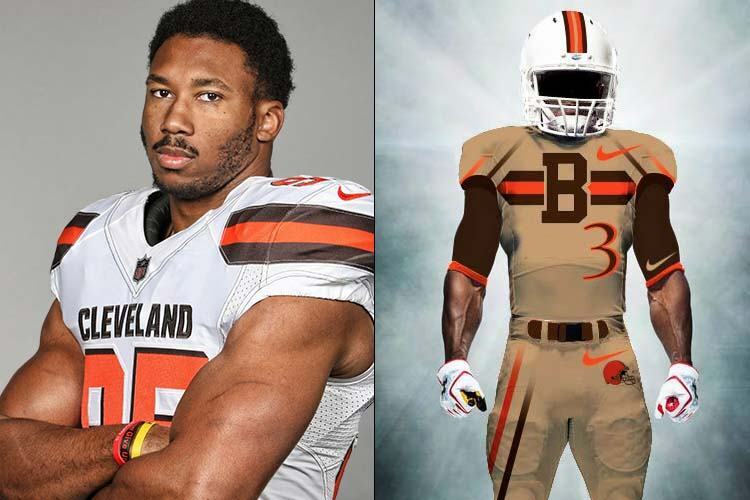 The orange “B” across the chest does a great job of paying homage to the Cleveland Browns’ rich draft history, while ensures that the jersey is being worn by fans of the Browns. Buccaneers – Would a change of uniform be the key to getting Jameis Winston out of that “promising developmental quarterback” distinction and into the “certified franchise quarterback” group yet? 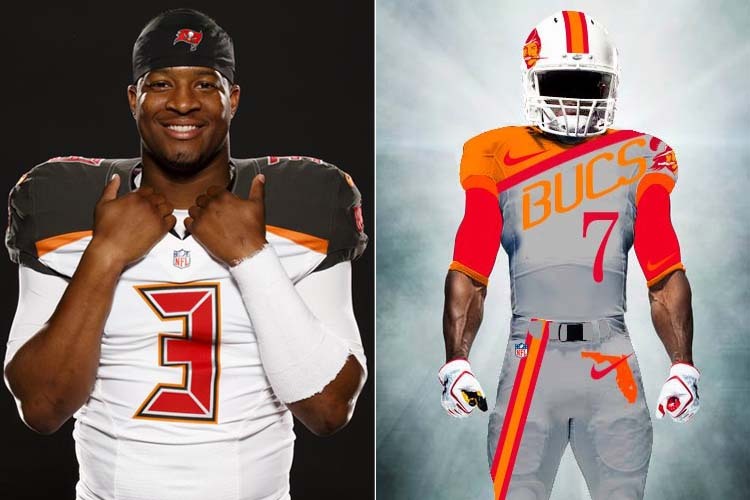 The only criticism is the abbreviated word “BUCS” across the front of the chest, which doesn’t do a good job of clarifying the team’s name is the Buccaneers. 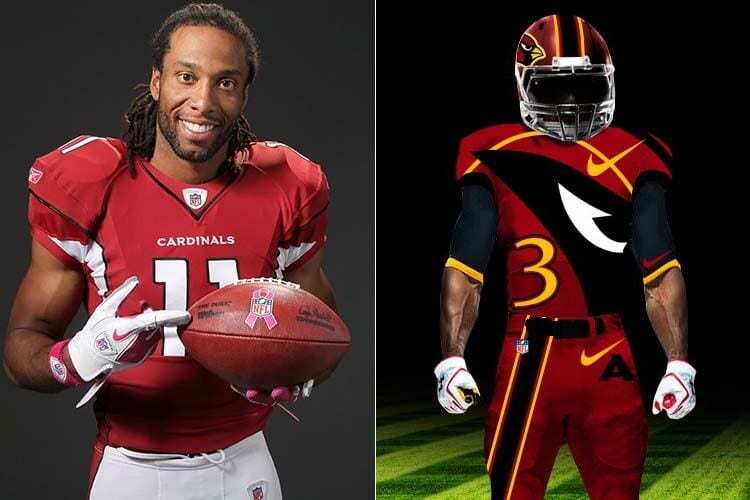 Cardinals – One of the most unique and eye-catching uniform designs among this list, the new look Cardinals uniform gives a bit more life to the usual red and white colors you see on its current uniform, plus the added in black part showing the eye of the Cardinal. The only question is: how much longer will Larry Fitzgerald be able to wear such a costume? 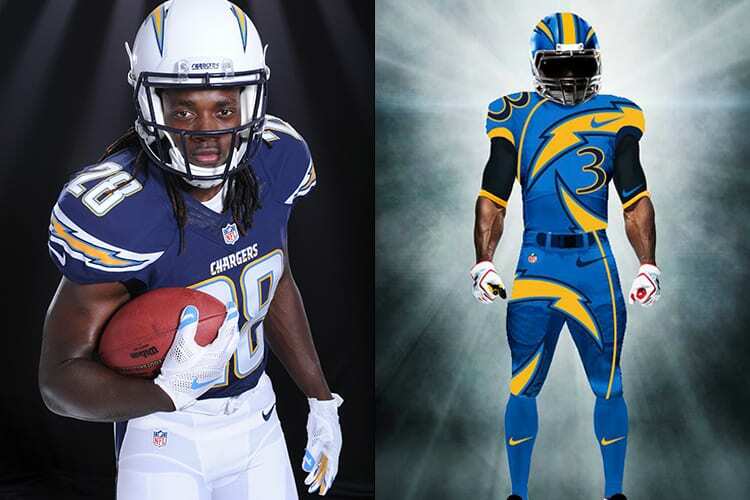 Chargers – For fans of the old power blue look for the old San Diego Chargers, this is right up your alley. If you want to draw some more fans to eastern Los Angeles to watch Melvin Gordon and the LA Chargers play ball, this would be a great way to do so (and sell a handful of cool, new jerseys as well). 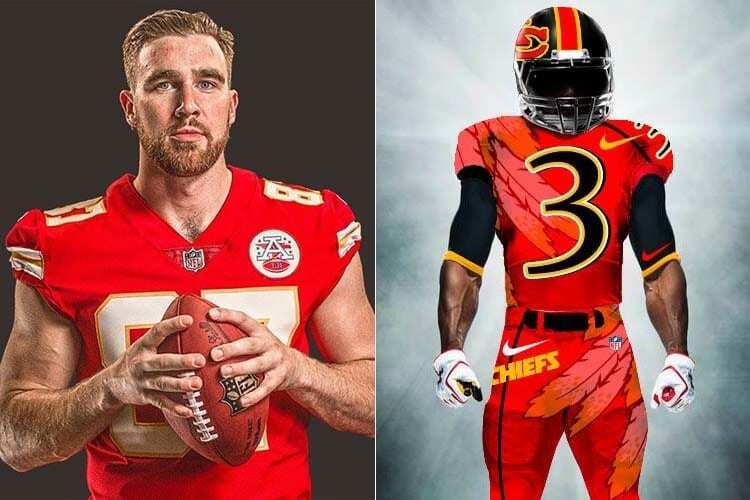 Chiefs – Chiefs tight end Travis Kelce certainly doesn’t seem like one of those guys who cares about what other people think of him, but this uniform might miss the mark a bit. The feathers on the uniform look a bit too close to the feathers on the helmet of the Washington Redskins. Also, there are too many shades of black being used overall. It’s been a LONG time since Indy fans have seen Andrew Luck in a Colts uniform. At this point, they’d love to see him out there, no matter what he’s wearing! The horseshoe logo on the front of the jersey is a nice touch (instead of the player’s number) but the uniform could really use a second color to give it a nice punch. This is one of the more mediocre designs on the list. 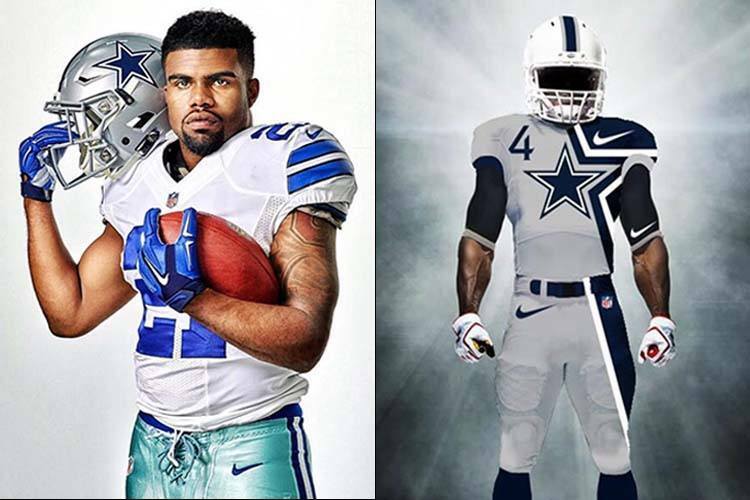 Cowboys — If you’re a fan of Ezekiel Elliott and the Dallas Cowboys, you might be reluctant to change the team’s iconic white and navy blue jerseys. However, this rendition really does a good job of accentuating the star on the uniform, instead of simply the one on the side of the helmet. 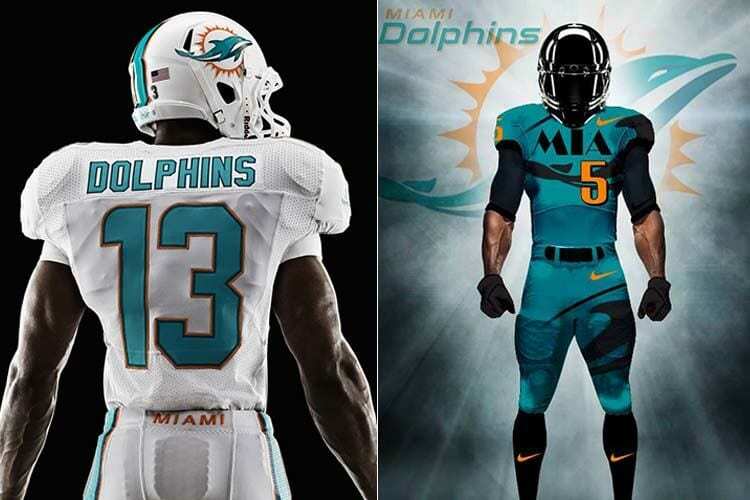 Dolphins — Changing the team’s uniform to a more modern design might be a good idea for the Miami Dolphins, considering so few people still go to their game. 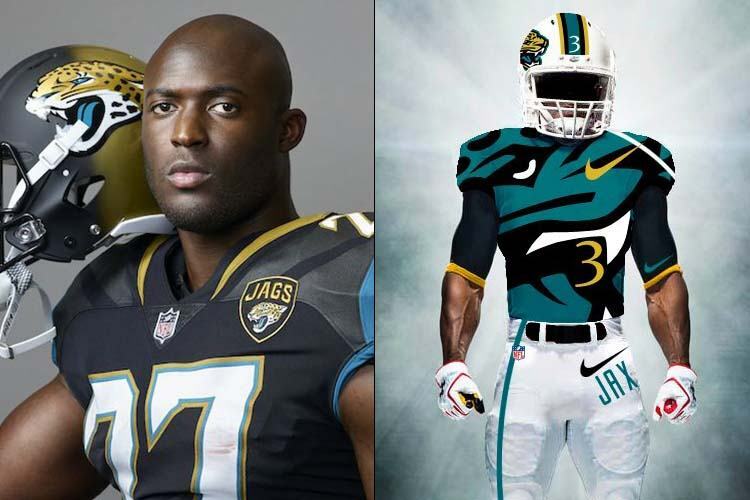 Of course, on first glance, this scheme looks a bit more like that of the Jacksonville Jaguars; so, are they trying to draw fans in Miami, or further up north in Florida? 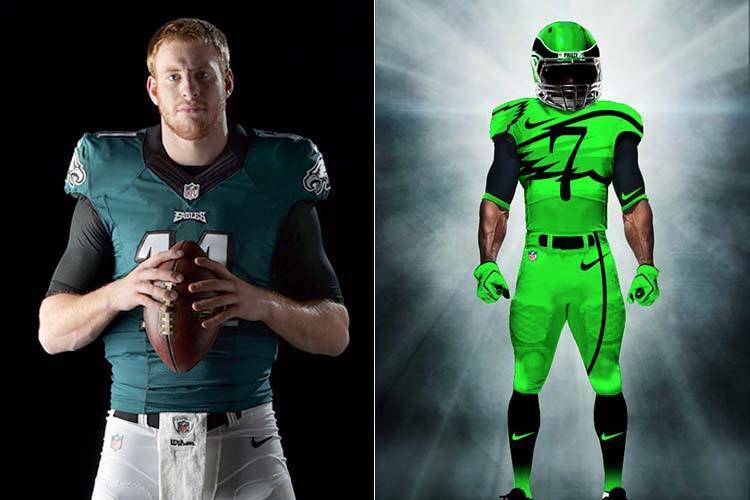 Eagles — After coming off their first Super Bowl win in the rich history of the franchise, perhaps now would be a good time to experiment with the team’s jerseys, and sell a few of them after having franchise quarterback Carson Wentz don them on game day. 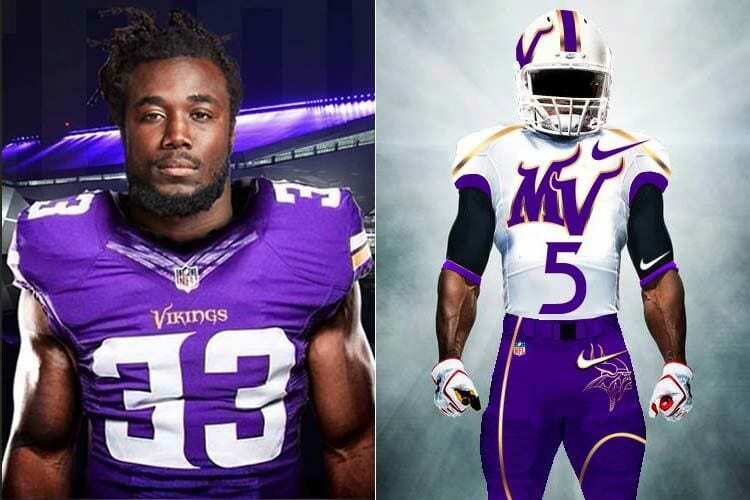 The biggest concern with these is that is seems to be harkening viewers back to the failed color rush experiment on Thursday Night Football this past season. Falcons – Another great example of sticking to the MO of “if it ain’t broke, don’t fix it,” while still giving the team a bit of a facial makeover. The angry Falcon now joins on to the uniform, balancing in the white very well with the number on the jersey. That way, they can clearly see how many times Julio Jones beat you over the top. 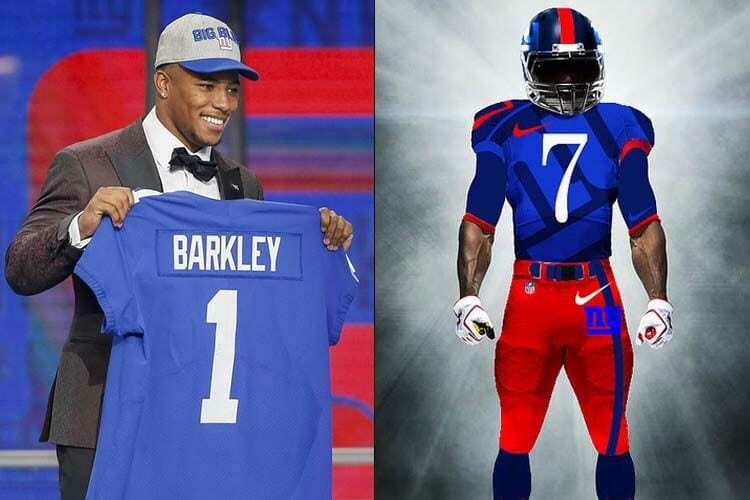 Giants – The arrival of Saquon Barkley to the New York Giants might be one of the most talked-about acquisitions this offseason. But are we sure we want to put him in a uniform that looks more like one of those “astropop”-type popsicles. There’s just too much red and blue going on, to the point where it drowns out any black spots. Jaguars — It seems like the Jaguars try to reinvent their uniform every year, in their never-ending attempt to get fans in the Jacksonville to actually come and watch the game. This uniform looks cool in general, though you wouldn’t realize the Jaguars symbol was in the background unless you knew what it looked like. At least Jacksonville has a star like Leonard Fournette to show off these potential new duds. 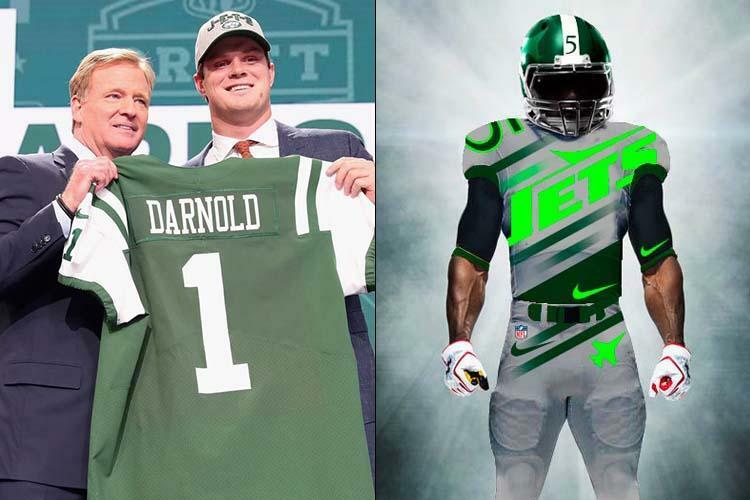 Jets — Being completely honest, this uniform is just plain lazy. You’re just taking a gray and green motif, and emblazoning the Jets logo used in the in the 80’s and 90’s on the middle of the jersey. Also, did they decide that they weren’t going to put the number on the jersey? It’s not the best look for their new franchise quarterback, Sam Darnold. Lions — It’s nice to give the light blue jerseys usually worn by members of Detroit’s football team a bit of an edgier look, considering the team mascot is the king of the jungle. 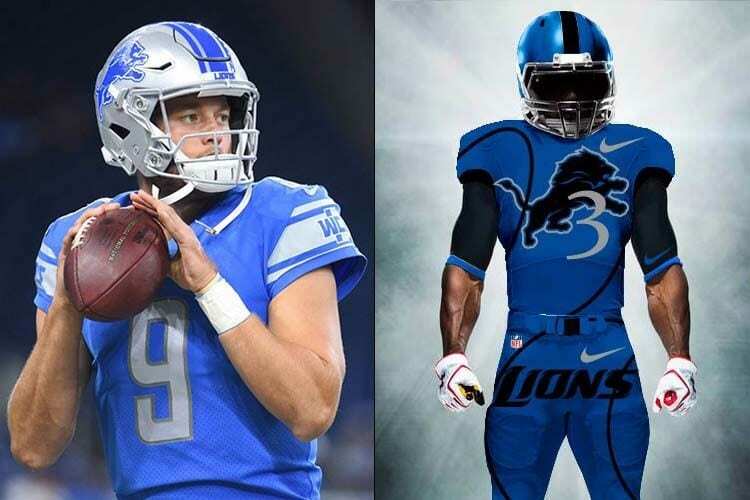 With the Lions logo in black right on the center of the chest, this would be a pretty slick look for Matt Stafford and company, and a nice segue into the Matt Patricia era in Motor City. 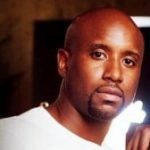 Packers – Here’ s a perfect example of the idea that not all change is for the better. 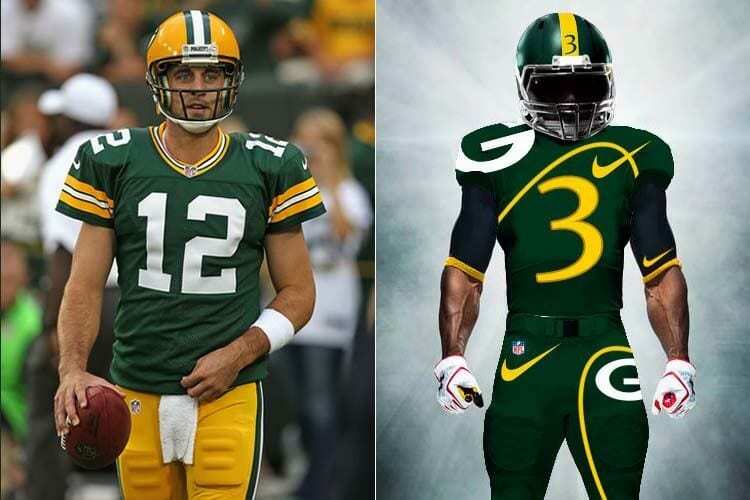 The current uniform of the Green Bay Packers isn’t exactly the most appealing thing to look at, but replacing it with this busy-with-nowhere-to-go uniform doesn’t suddenly make the uniform look any better. Instead, it would look like a green and gold scrapbook being placed on top of franchise quarterback Aaron Rodgers. 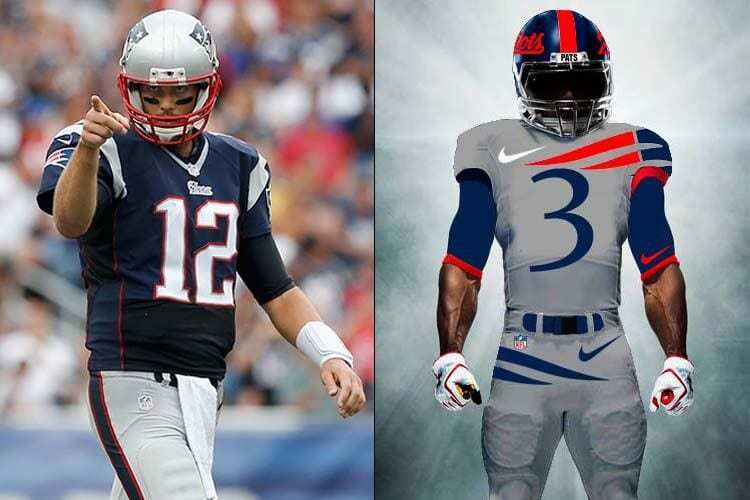 Patriots – This uniform could work fine as a third or alternate uniform for Tom Brady and the New England Patriots, if for nothing else but the fact that there’s really not much to it. The “tail” of the Patriot’s hat on the side is an interesting look, and the cursive “Patriots” being moved from the chest to the helmet is interesting, but there’s really not much else to this. Raiders – The NFL likes to try and introduce new jersey looks to the public, with the hope of selling them for revenue. But in this case, it’s once again a situation where “if it ain’t broke, don’t fix it.” The Raiders silver and black is an iconic look, and this sword-bearing new uniform is a hot mess. 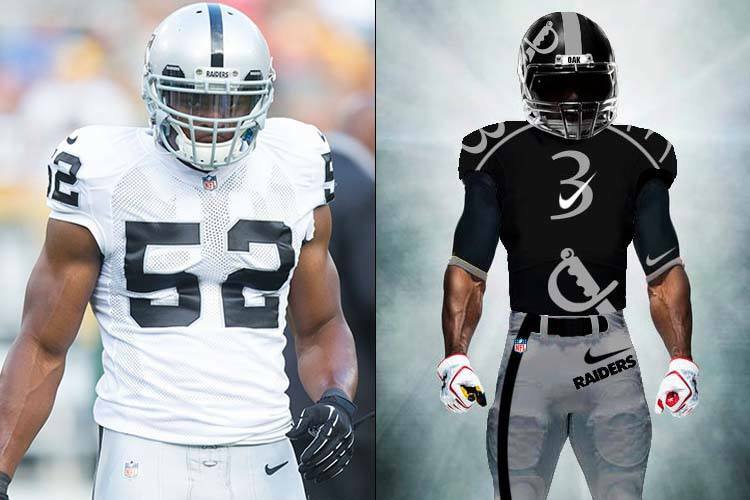 There’s no way Khalil Mack and his teammates should be wearing this. Total fail. Rams – For much of the Rams first season in Los Angeles, they went with their old throwback look of the old Los Angeles Rams. This new look is interesting, as it’s more of a “throwback” to the “Greatest Show On Turf” days, when Kurt Warner, Marshall Faulk, and the rest of those guys were wearing the blue and gold look. 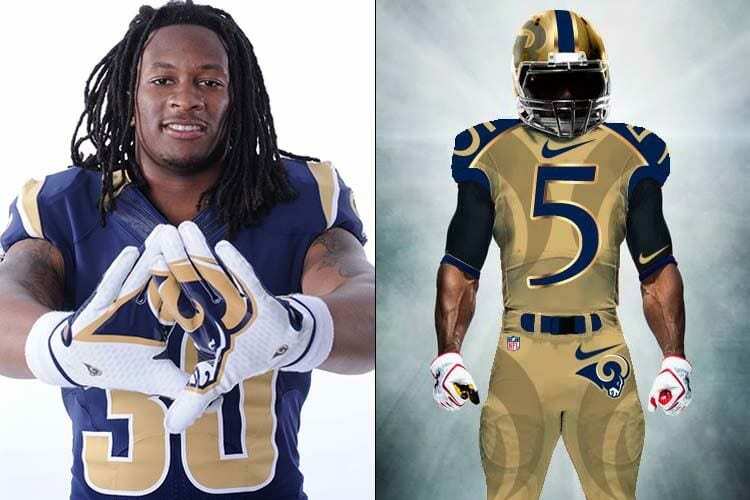 It would look pretty sleek on All-Pro running back Todd Gurley as well. 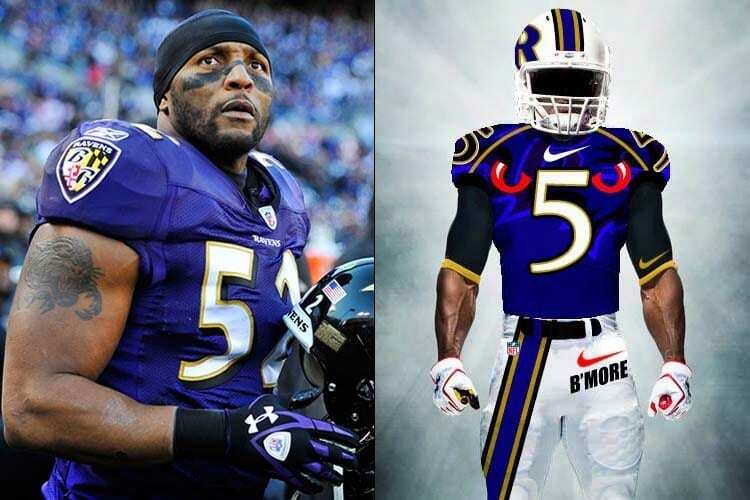 Ravens – That incredulous look you see on Ray Lewis’ face is probably his first reaction to seeing this abomination of a uniform concept. We get that the two red rings on the pectorals of the player are supposed to look like the eyes of a Raven, but they instead look like two strawberry doughnuts with a bite taken out of them. The purple and gold (and red) just don’t go well here; this thing is a total eyesore. 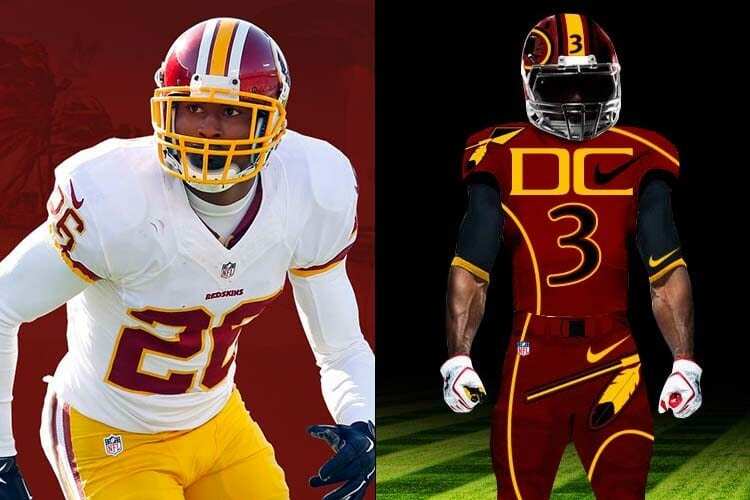 Redskins — There are two ways to look at this uniform rendering for the Washington Redskins. For one, the “DC” across the chest of the uniform, while maintaining the team’s burgundy and gold motif, works really well here. But if you were going to redesign the uniform, why keep the Native American emblem on the helmet, when it’s been the source of such national consternation? After changing that, you could have a pretty sleek look. 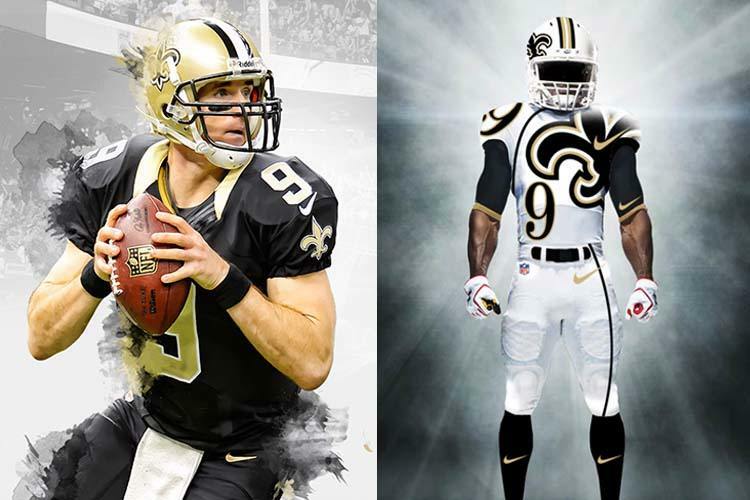 Saints — This uniform mockup for the New Orleans Saints is definitely thinking outside-the-box. The problem is, it might be doing so too much. The way the jersey number sits at the bottom right would make a football player — like quarterback Drew Brees, in this case — look more like a playing card. That’s definitely far from what the team represents. 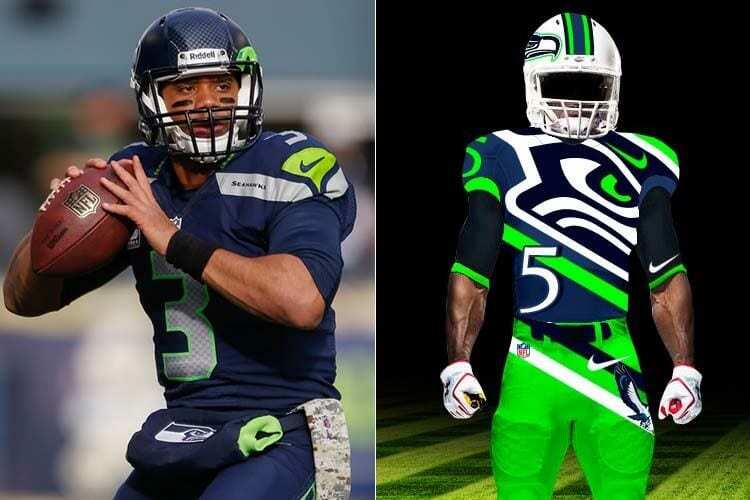 Seahawks — When the Seattle Seahawks wore their neon green uniforms as part of the NFL’s “color rush” marketing scheme on Thursday Night Football last year, nearly everyone agreed that Seattle’s uniform was pretty harsh on the eyes. Now, take that harshness and multiply it by 10, and that’s how gross this uniform is. It just looks like someone left a box of crayons out in the heat, and they all melted. Please don’t make Russell Wilson wear something that looks like this. 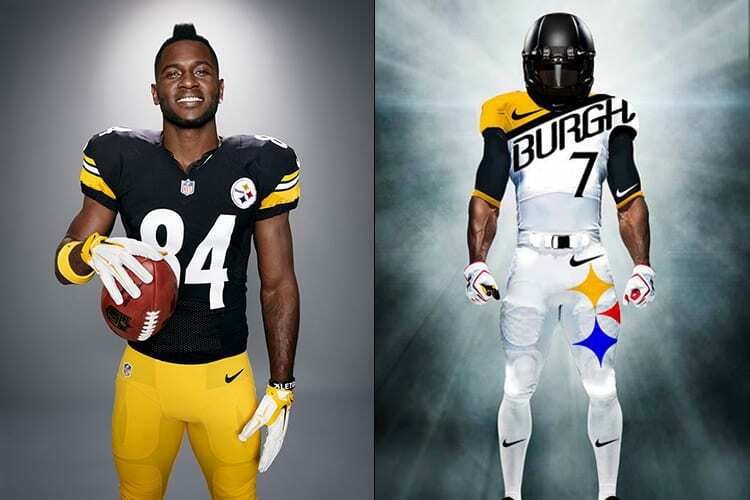 Steelers — Since the Steelers play in the lone city with a “Burg” in the name of it that has a professional football team, this uniform could work fine for Antonio Brown and the rest of the guys on Pittsburgh. But here’s the bigger question: for a team who’s identified as being the “black and gold,” is there enough of both or either of those colors on this uniform? It’s basically all white with a hint of black and gold accents. Is that enough? 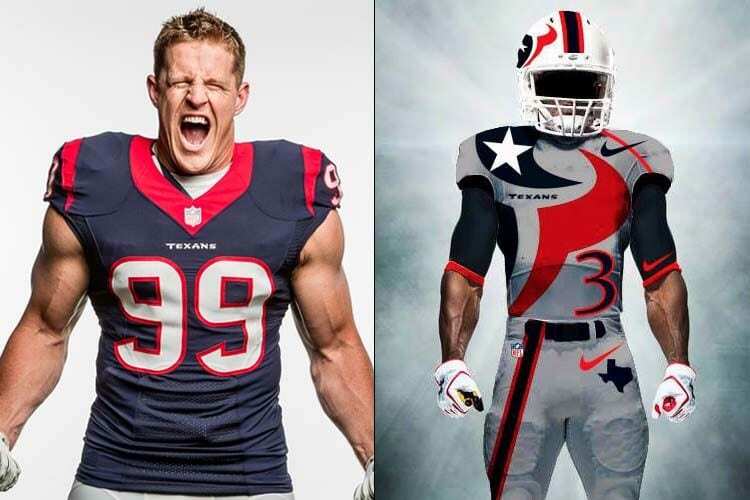 Texans — The people in Houston would probably love this uniform, given it blends two of two of their favorite things: football, and the red, white, and blue colors. The horns of the Texas steer are creatively placed on the uniform in an artsy way, but opponents wouldn’t really notice that if they’ve got (a hopefully healthy) JJ Watt coming at them every play. Titans – The Tennessee Titans already have a uniform that’s uniform that’s unnecessarily complicated, so you’d think re-examining their look could work; that is, until you come up with this design. This rendering could be the worst one of all 32 teams on this list. It’s just a Titans blue jersey that looks like someone hung those letters you usually see hanging from a wall at a birthday party on this jersey. 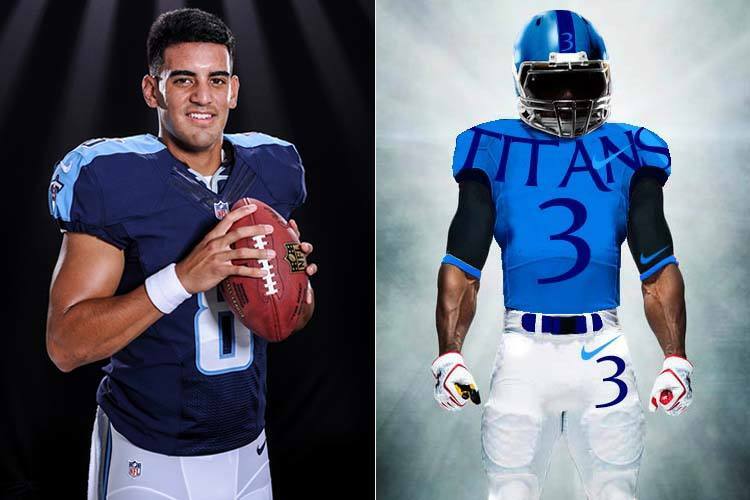 Nobody would want to watch Marcus Mariota and crew wearing this joke of a design. Vikings – The Minnesota Vikings already have an incredibly loyal fan following, but if they wanted another way to engage their fans — on top of the famous “SKOL” chant from last year — this might be a fun and interesting way to do so. The Vikings-font “MV” is a pretty nifty look. Dalvin Cook, along with new quarterback Kirk Cousins, could likely sell a whole bunch of these.